Two parents are arguing over their 23 year old son who isn’t in school, doesn’t have a job, and lives at home, where his stay at home mother cooks, cleans, and does his laundry for free. It’s lunch time, but the son has just stumbled down looking for breakfast. The mother starts to get up from her lunch and fix something for him. The rumpled son who needs a shave, shrugs and picks up and apple from the fruit bowl on the counter. She takes the apple to the sink. She washes it with soap, dries it with a paper towel, takes out a knife and begins cutting slices onto a plate. She carefully removes the core and seeds. “Apple seeds are poison,” she says. Now who do you think she’s cutting that apple for? Her son? I doubt it. She could be cutting up that apple to make a point with her husband. Maybe she was sick last week and needed someone to stay home and bring her soup, but it was her husband’s poker night so he left her to fend for herself. Or, maybe she’s trying to convince herself she’s still needed by her family, that it’s up to her to keep them away from pesticides, and poison apple seeds, and anything else dangerous in their path. Or, perhaps it’s a statement to her controlling mother who died before she could show her she isn’t the incompetent nincompoop her mother always said she was. 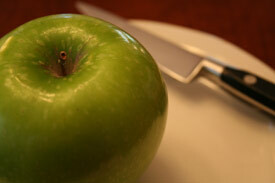 What I’m saying is, don’t let your characters cut up apples simply to be cutting up apples. The character’s history and emotional state should imbue his every action with meaning. When you write from the character’s emotional standpoint, rather than an action standpoint, your writing becomes full blown – it works on many levels. It loses its dry and mechanical feel and grows rich. Why was she so mean to me? Why does he treat me like I’m an idiot? Because he’s no good at doing his own job and it makes him feel better about himself. Why did he leave me for a younger blonde? He’s overcompensating for growing older. The reader likes to figure these things out too. You never tell them in words, it’s understood from what you have built into your novel, as well as from what you’ve left unsaid. You’ve given the reader an understanding of the character in a lot of ways: the way your character perceives the world, the way other characters respond to them, the things they place importance on, the things they neglect. All of these details are telling, and they grow our understanding of a character’s psyche and make them compellingly real to the reader. What do you feel you must know about your character before you can begin to write? How do you keep a character compelling over the course of an entire novel? This entry was posted on Tuesday, January 18th, 2011 at 1:37 am and is filed under . You can follow any responses to this entry through the RSS 2.0 feed. You can leave a response, or trackback from your own site. I rely on the characters to reveal themselves as I write–a scary method, I know. It is like working without a net and requires frequent revision, but although I spend plenty of time with my characters as I walk through my daily life (I have aha! moments in the shower or while lying awake in bed) characters express themselves best as I write their stories down. This method is not for everyone. Many writers are natural planners. Many strike a balance between planning and following an elusive glimmer. Each writer finds their own way to deepen their knowlege of a character, moving from chance acquaintance to deep understanding. My characters express themselves naturally when my hands are on the keyboard. For me, the characters just come. However you do it, Adrian, don’t stop! You do it well. While writing my first novel, I let my characters come to me in much the same way you do. This time I have a better idea what my current novel is about, so in outlining it, I have a stronger grip on each character’s place in the story. I think at heart I am somewhere in the middle; before I begin typing the new novel, I will have at least a kernel of how the main characters’ personalities will fit into the theme. But it’s an organic thing; I think I am planning this outline, but in reality, much of it just comes as I noodle. Although I deliberately place a character in a particular situation, e.g., at a dance, I have no idea what he/she is going to do or say until they do it. They lead me about by the nose. Their dialogue is more often than not a surprise, albeit I intervene to keep it on track if necessary, or to polish. Quite often I find myself near wit’s end trying to control the action. The end of a chapter usually just happens. It’s like being led around by a muse or a god, and I like it. No, I love it! Oh Leigh, what a clean, clear statement on creating the everyday in a story. No matter how the scene initially develops–I am not a planner and lean to the surprise–when it’s in a final draft, there has to be a point to those apple slices. In his book, WRITE TO LEARN, Donald Murray applied the “so what” test as in “so what is your point?” Seems to me if it’s only have apple slices, you might want to consider applesauce. Leigh, your blog is fresh, thought-provoking: a place to write, a place to learn. Between you and Adrian, I’m in blog heaven. Thanks for the kind words, tgumster, and welcome to Roadhouse. I haven’t read WRITE TO LEARN, but I will certainly look Mr. Murray up because the “so what” test is the key to strong writing. Each page has to stand on its own two feet and make the reader want more. It takes stamina, sharp editing, and a whole lot of coffee to keep to that standard, but writers owe their best effort to both their readers and their work. “Seems to me if it’s only have apple slices, you might want to consider applesauce.” What?!?!? Correcting a blog post is the futility of trying to make your point again; yet, cyberspace provides a fluid opportunity the printed page denies. Always, I take opportunity where I find it: make your point plainly please or you may get applesauce when you least want it. tgumster, we all knew you meant TO have apple slices; your point was well-taken. I have been dying to correct the last sentence in the second paragraph of the post ever since I put it up. We’re humans with clumsy fingers that can’t begin to keep up with our brains. Not to mention whatever glitch in this system makes the typing speed so awkward (my favorite elf is working on that by the way). Worse is when you look back at something you published 10 years ago in hard print. Now THAT’S embarrassing! But it’s true, our eyes and brains play tricks on us. No matter how many times I edit a piece, I often get to my critique group and find there is a spot where my brain has been inserting the word I left out on the page. There’ll be a new one on Tuesday, Chris. Have to do some real writing sometime.